As Pushkin Hills opens, Boris Alikhanov is on his way to what he hopes will be a chance to pull the unravelling threads of his life together. He intends to secure a summer job as a tour guide at the Pushkin Preserve, a rambling estate dedicated to honouring and celebrating the life and memory of the famous Romantic Russian poet. He himself is writer whose literary ambitions have remained unrealized while his journalistic endeavours have raised a few official eyebrows. His marriage is in shambles, his refuge is the bottle. As familiar as the tale may be, it is evident from the earliest pages that we are in the company of a narrator who is out to chart his own decline with a dry sardonic wit that manages to be, in turn, political, philosophical, and laugh out loud funny. Accepted on a trial basis by the collection of Pushkin fanatics in charge at the tourist centre – most of whom seem to be rather desperate middle aged women – Boris settles into ramshackle accommodations in a nearby village with a landlord even more decrepit than his abode. He then sets out to learn the tour guide’s script and routine. His stint at Pushkin Hills begins well. He masters the art of herding groups of tourists around the estate, riffing on the script when required and suffering the most foolish inquiries with surprising equanimity. Until his wife arrives. She is determined to move to America with their daughter, eager to follow the waves of immigrants leaving Russia, but Boris is bound by some attachment that he is not ready to cut. She asks him to join them or set them free, he begs her to stay. Yet once it becomes clear that she is committed, in fact even happy to be moving on with her life, he quickly begins to lose his precarious footing. Boris, for all his shortcomings is a deeply human and likeable protagonist. Even for a reader who lacks the depth of background in Russian literary and political history to pick up on all the allusions and often intentional misquotes in the text, Pushkin Hills is an intelligent, entertaining read. (An unobtrusive series of footnotes add basic background where relevant.) Originally published in Russian in1983, this translation by the author’s daughter, Katherine Dovlatov, brings to life a novel that manages to feel fresh and vital more than 30 years later and 15 years after the author’s death. As the translator notes in her acknowledgements, being able to work with her father’s rich material has allowed to her to continue a precious dialogue. A special gift indeed. 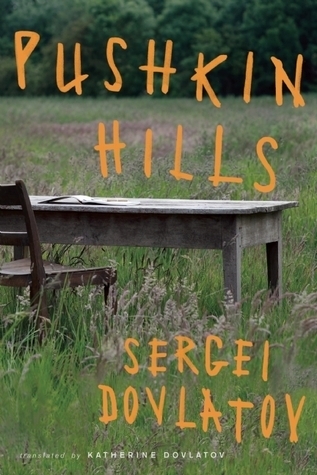 Pushkin Hills has been longlisted for the 2015 Best Translated Book Award (BTBA). Enjoyed review and it sounds good. As you’d expect the BTBA doesn’t get much coverage over here though I’d heard of it just the other day when reading about the novel 1914 by Jean Echenoz which is also nominated. I’d put that on my list at the time and I will add Pushkin Hills to that ever-growing list! I reviewed the UK publication of this – I’m glad to see it on the BTBA long list (which has the advantage over the IFFP of accepting the work of dead writers). I liked the way it contrasted the state’s reverence for the safely dead Pushkin with the treatment of living writers like the novel’s protagonist. There is a lost of bitter sarcasm here for certain. The BTBA list is especially varied because it can highlight writers and works that are long overdue for wider recognition. I have also discovered a raft of independent publishers based in North America that I did not know about. And being able to find titles like this on a shelf in a local independent bookstore is even sweeter! I have no intention of reading the entire BTBA list and some of the titles are very bleak/experimental. Such a diverse range. I still have to finish Zone for the IFFP challenge myself. I’m not sure I’ll get to Zone, especially as it isn’t on the official list which are the Shadow Jury of, but I would like to read it eventually. I often find translated books bleak, even for the IFFP. Especially last year’s list! But, I suspect that is part of why they are so poignant. It makes me feel not quite so alone in my times of sorrow. Laugh out loud funny? I like the sound of that! There aren’t enough books that make us laugh in my opinion. Well I thought it was funny, despite the sad undertone. The narrator’s humour and observations made it such an enjoyable read. And I felt like the fact that his daughter was the translator added an extra warmth.